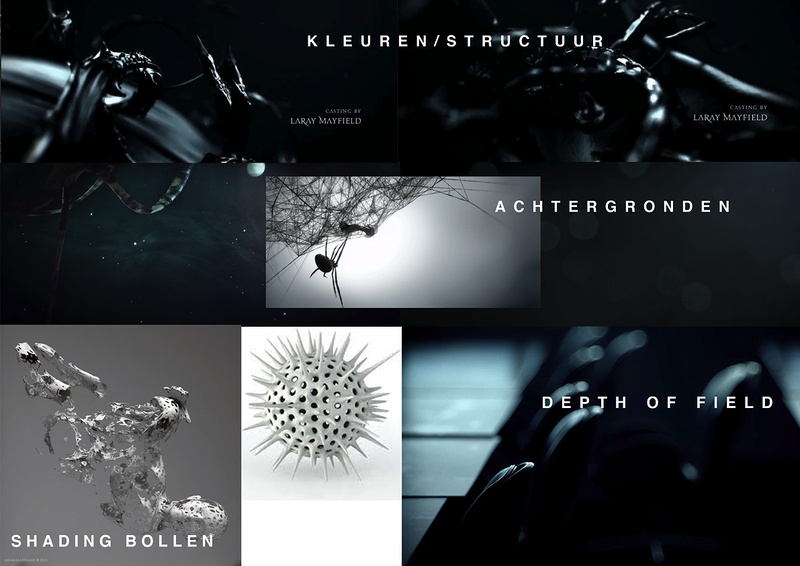 Last year we had the pleasure of taking a trip into a microscopic ferrofluid world conjured by Dutch Film Academy visual effects student Guido Ekker and now the filmmaker returns with an impressive title sequence for Gonzalo Fernandez’s short film Chimera, which delves into the formation of evil at a molecular level. Ekker gives DN a magnified view of his title sequence creation process. Before the project kicked off I sat down with the Director of Chimera, Gonzalo Fernandez. The short film is about a man who can not control himself and follows his instinct as a wild beast would do. Towards the end it winds up in a horrible killing scene of a young women. Gonzalo wanted an intro that is all about the genes of the evil inside the main character, the beginning of a new cell inside his body. From there on I pitched 3 idea’s to him with rough sketches/edit. He choose one of them and from there on we went further. So the first week was only previz and editing because the previsualization was also going to be the edit in the later stages of the project. Due the tight deadline we had to make the “previz” as solid as it could be so there wouldn’t be any changes later. The editing was part of my duties as I was overseeing the project and creative development (direction). A moodboard was made to set the style of the whole intro. That was one of the main key elements that had to be right. As part of creating an intro we watched other great pieces of work many times which may be in the moodboard..
After the first week the previz was solid and we moved on to creating the piece. Within that second week we also did research and development, particularly on the scene where the sphere collapses and the veins escape. That scene was done using Houdini and the rest was all done in Maya, rendered with the Arnold renderer and composited in NukeX. During production the highest peak of people working on the project was around 8 but that I think was only for the last days of the 3rd week. We had great fun creating it and it ended up just like we had in mind. In the end a friend of ours Sebastian Romero, who is music composer, made a really nice score for it! We’re hoping to create more of these kind of artistic sequences. It was a fast paced project but really worth making and enabled us to gain more experience during our time at the Dutch film academy.